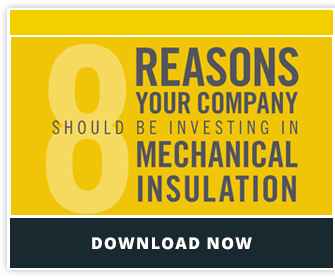 I can talk all day about the energy saving benefits of mechanical insulation, but for most decision-makers, the bottom line comes down to money. What is the return on my investment and how long will it take me to get there? For a large or medium facility (from 26 Btu to over 500 Btu/year), the payback period is about 1 year on average. That means that within one year, these facilities are making their investment back through cost savings associated with energy loss. Over a period of 20 years, the ROI is estimated to be 103%. For small facilities (less than 26 Btu/year), the payback period is about 9.6 months. Over 20 years, the ROI is estimated to be 135%. Here are some more facts for you. Information from assessments completed through the DOE’s Industrial Technologies Program specifies that 82% of businesses saw a return on their insulation investment in less than a year, 15% saw a return in less than 3 years, and 3% saw a return in more than 3 years. It is also important to note that facilities that properly maintain their insulation will see a bigger and faster return than facilities that don’t. Calculating insulation’s effectiveness takes many factors into consideration, and the better maintained it is, the better it will work. Isn’t that true with anything? You can start planning for your company’s insulation investment and ROI getting an insulation energy audit.